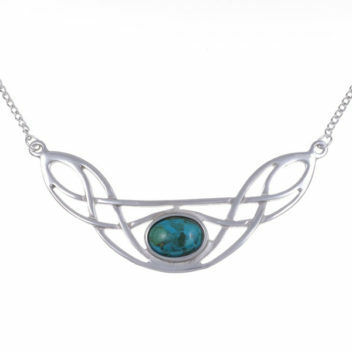 Pewter open work Celtic knot with oval turquoise cabochon on a stainless steel curb chain. Turquoise represents courage, fulfilment and success and is also a signifier of strength and power. Overall length of the necklace is 19″ – 48cm, designed to sit on the collar bone. The Celtic Bow Necklace is presented in a velvet lined black gift box. Each piece of St Justin jewellery and gift ware is crafted by hand and eye near Penzance in Cornwall, the South West extremity of Britain.